The state-managed Izembek Lagoon in the Izembek National Wildlife Refuge is an amazingly important migration stopover for many birds migrating to or from Arctic breeding grounds. 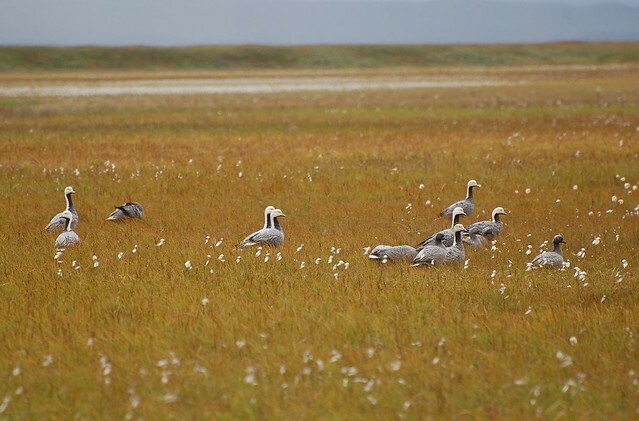 The area regularly supports more than 90 percent of Brant that use the Pacific Flyway, more than half the world population of Emperor Geese (pictured above), and a significant percentage of the world populations of Steller's Eider and Taverner's Cackling Goose. More than 82 species have been documented here. These are a few of the reasons Izembek is part of the globally significant Izembek-Moffet-Kinzarof Lagoons Important Bird Area. Izembek Refuge is perhaps best known for the huge number of brant, a small sea goose, that stop over during spring and fall migrations on their way to and from their breeding areas in Alaska, Canada, and Russia. The entire Pacific population of black brant, approximately 150,000 birds, can be seen in the Izembek Lagoon area every fall. The brant begin to converge on the area in late August, with numbers peaking in early October. They spend up to eight weeks feasting on eelgrass and preparing for the arduous non-stop migration to their wintering areas in Mexico. Some of the brant depart abruptly in late October or early November, leaving up to 50,000 to brave the stormy winters of the southern Alaska Peninsula. Most of the world population of Steller's eiders traverse the Bering Sea from nesting grounds in arctic Alaska and Russia to molt and/or winter on the southern Alaska Peninsula and Izembek Refuge. Steller's eiders are highly dependent on the continued health of the lagoons and bays that foster eelgrass growth. Eelgrass communities are among the most diverse and productive in the world, providing food and nursery areas for fish, crabs, and many other invertebrates. The invertebrates, in turn, provide an essential food base for the Steller's eider and other species. Over 78,000 individuals of more than 30 shorebird species pass through the Izembek area during migration. The most abundant migrants are rock sandpipers, dunlin, and western sandpipers. Rock sandpipers are also common during summer and winter. Many seabirds, including storm-petrels, cormorants, puffins, oystercatchers, guillemots, gulls, and terns, nest on the rocks and islets offshore. Raptors, which prey on the many species of birds and fish in the area, include bald and golden eagles, rough-legged hawks, gyrfalcons, and Peale's peregrine falcons. At least 10 species of migratory songbirds nest within the Refuge, while five species of songbirds are resident year round.